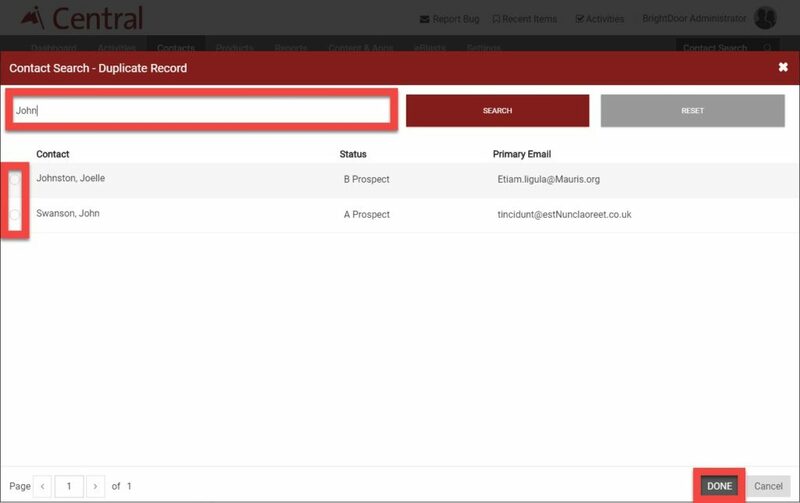 BrightDoor Central allows you to merge two contacts; including contact information, notes, activities, and product ownership from two separate contacts records into one contact record. For example, a common merge would be to combine one contact saved as a shortened name (i.e. Frank) to the other contact saved under a full name (i.e. Franklin). To begin, remember the ability to merge a contact is a user based permission, you must enable this for each user’s role group. First, click the “Setttings” tab from the main navigation bar. 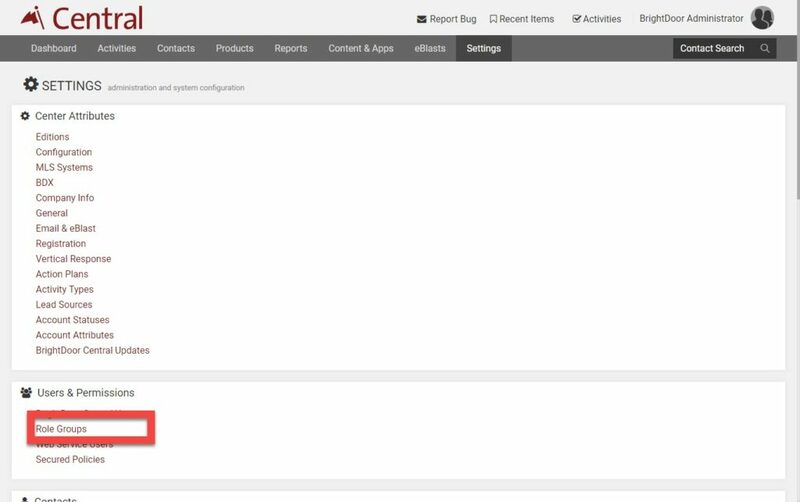 *This step can be skipped if you have already allowed your user role to merge contacts. Second, click on “Role Groups” under “User & Permissions”. From the Role Group Name list, choose which role group you want to allow permission to (in this case we chose “Admin”). Select “Edit”. From the permissions click the box so it is blue and checked for “CanMergeContacts”. *Hint: If the “CanDeleteAnyContact” permission is selected for a role group then the “CanMergeContacts” we also be selected. 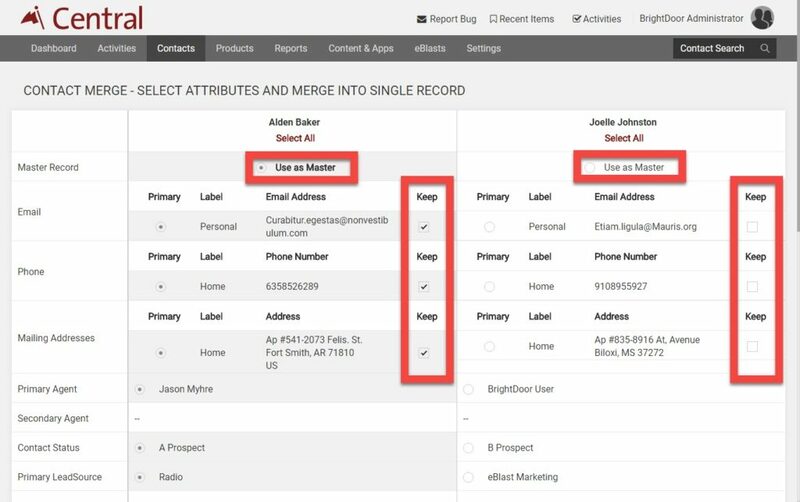 To begin the actual act of merging two contact records, proceed to the contacts tab at the top of the page and search for one of the contacts you want to be a part of the merge. Select the “View” button for the contact you want to keep. From the Actions menu on the contact record, select “Merge Contact”. You will then see a window pop up that will allow you to search for the other contact that you want to merge with the first contact. Select the contact, then Done. After this step you will come to a screen with both contact records side by side. You will choose which one you want to be the “Master” this is the record that all the data from both records will stay in. You can then select which data you want from both records to stay by selecting or deselecting the blue bubbles next to each piece of data. You will then select “Save” at the bottom left hand corner of the page, and a screen will pop up to finalize your Contact Merge. *Note: All activities will automatically move over to the primary contact, as well as, all product ownership.